s adventure one word you want to describe your honeymoon? For couples planning a honeymoon, adventure seems to be more and more important in choosing a destination. Here at Smoky Mountain Outdoors, we love exciting adrenaline-filled entertainment. Whether you want to learn about fishing in the National Park or enjoy white water rafting in Tennessee, once-in-a-lifetime experiences in the Smokies seem to be important to honeymooners, so we’ve created a list of exciting things to do on a Gatlinburg honeymoon. To those of us who live in the Smoky Mountains, the best adventures are outdoors. Our area has a comfortable, moderate climate and beautiful views, so much of our time is spent outside. It’s no wonder our most exciting experiences are outside! Hiking in the Great Smoky Mountain National Park is a unique activity for honeymooning couples because the National Park is always changing. Each season brings a different look and feel to the area, and there are always diverse wildlife and plants to discover. With over 800 miles of trails, couples can choose an easier paved path or a more challenging trek through backcountry. Not only will horseback riding give you a chance to enjoy the mountain scenery, it’s also a killer workout. You could burn 148 to 690 calories per hour while riding! Though this is a great way to exercise, it is also the most relaxing adventure on our list. This fun activity may be Trotting through the forest while enjoying the scenery will be a memorable honeymoon activity you can talk about forever. 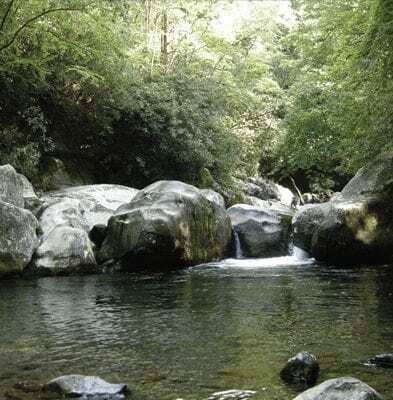 No adventurous Gatlinburg honeymoon is complete without a trip down the Pigeon River. White water rafting in Tennessee is as exciting as it gets. With white, frothy rapids and a guarantee to get wet, no trip with Smoky Mountain Outdoors is boring. We offer kayaks rentals as well as rafting rides, and our trips Upper Pigeon River Rafting trips are the most popular. On these trips, you’ll spend two hours on the river where a certified guide with navigate the raft the entire trip. By the time you arrive at the end, you’ll know why white water rafting in Tennessee is the best adventure you can have. Smoky Mountain Outdoors has some of the most exciting white water rafting in Tennessee. Not only do we offer great rafting trips, we also have discount attractions packages that allows you and your new spouse to enjoy rafting and another attraction at a discounted price. We have a variety of attractions and theme parks in packages, so be sure to check them out.